For those convinced that renewable energy can't work without subsidies, Dave Roberts at Grist points to a notable finding. The Environmental Law Institute has released a study that shows that fossil fuel subsidies far exceeded support for renewable energy over from 2002 to 2008: Grist also reports that Barack Obama and other world leaders announced at the the G20 meeting last week that they would start phasing out subsidies for fossil fuels. It's a good first step: stop spending public money to dig us deeper in a climate hole. 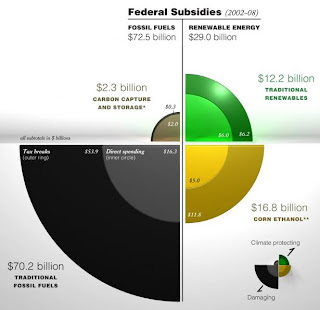 But it will be hard to eliminate fossil fuel subsidies entirely, particularly when support for carbon capture and sequestration will almost certainly be part of the climate bill that emerges from Congress.